Crossocheilus Siamensis, otherwise known as the Siamese Algae Eater, is a member of the Cyprinidae (carp) family. In the wild, they live in Thailand and the Malayan peninsula. It is a relatively hardy species to keep, as long as there is some algae in your aquarium, or you feed them some algae wafers and maintain your aquarium well. The Siamese Algae Eater can grow to about 6.3” (16cm) and need at least a 30-gallon aquarium to accommodate them in a group of about five or more. This fish can be kept on their own, but it thrives best in a group. They are non-aggressive to other fish but can be territorial to their own species. So as long as you have other peaceful fish in your aquarium, there should be no issues. What do Siamese Algae Eaters Looks like? The general appearance of the Siamese Algae Eater is a long and slender body that is brownish-beige. Along each side of the fish is a black stripe which extends to the edge of the caudal fin. The caudal fin is almost clear apart from this. Likewise, the fins and rostral barbels are transparent. Differences between males and females are slight with the male being slightly more slender than the females. The Siamese Algae Eater is often confused and sometimes mislabelled in pet shops, with the False Siamese and Flying Fox. Luckily there are a few, easy to spot, differences between the species that should help you correctly identify them. The black stripe between the species has two main differences. Firstly, the False Siamese Algae Eater has a gold strip above the black one. The black stripe also does not extend into the tail fin; it stops at the base of the tail. The brown coloring on the False Siamese Algae Eater is also darker than on the Siamese Algae Eater. In addition to the gold banding, the Siamese Flying Fox has a trace of yellow-orange on their fins. The Siamese Algae Eater has clear fins. In addition, it is important to note that the Siamese Algae Eaters do not have the swim bladder. This means the fish must be in constant motion or it will sink to the bottom of the tank and may die. So it’s important to have the correct conditions and water circulation in your tank. The Siamese Algae Eater is a fairly hardy fish. In the wild, it lives in flowing streams and tributaries which have a pebble, gravel or sand substrate. There is often submerged driftwood or tree roots in the stream. Their habitat in the wild has clear, often shallow, water. The sunlight aids in the development of biofilm that the Siamese Algae Eater feeds upon. Some experts believe the fish will migrate to deeper waters at times. In the aquarium, it is best suited if you can match the primary conditions as closely as possible. A well-maintained tank with submerged decorations, like driftwood, with a gravel substrate should be sufficient. You should try creating a flow in the aquarium to match the water movements of a stream. The aquarium should be at least 30 gallons. An appropriate size for a group to thrive is 150cm by 45cm. The challenge for this setup is that many aquatic plant species will struggle to thrive in such conditions. However, you can plant Microsorum, Bolbitis and Anubias spp.. These can attach to décor and with the right light will develop algae that the fish will feed on. The introduction of driftwood, the water movement, and these plants will help the fish to also display more natural behavior. A word of caution should be mentioned, though. Many fish who live in running water setups are intolerant when there is a build-up of organic waste. This fish requires regular water changes and clean water to thrive. You should also ensure that the water has a high level of dissolved oxygen. This and the water movement can be easily achieved through the use of a good external filter with a powerhead. Though there are other options currently available on the market. This fish has a wide tolerance of temperatures and can survive in conditions between 20 and 26 degrees Celsius. However, it is best if you can maintain a temperature between 24 and 26. The Siamese Algae Eater prefers its tank to have a neutral pH. So if your aquarium is between 6 and 8 you should be okay. The hardness of the water should also be between 18 and 268 ppm. The best way to test for correct pH levels is to use a digital pH tester like this the HM Digital PH-80 pH Meter . We find ordering online from Chewy.com is fast, cheap and easy. We have provided the link to make purchasing easier for you. These fish are notorious for jumping out of your aquarium so having a tightly fitted lid is vital to ensure you don’t wake up one morning to a dead Siamese Algae Eater on your floor. What to feed your Siamese Algae Eater? The Siamese Algae Eater will consume various foods. It is an omnivore that in the wild will eat algae, periphyton, and phytoplankton. 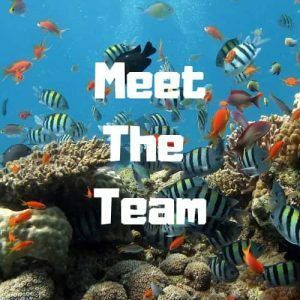 In the aquarium, it will willingly accept a wide variety of commercially available fish food, live food, algae wafers, meaty foods and catfish pellets. One of the biggest myths surrounding the Siamese Algae Eating myth is its use when you are overgrown by algae. This is incorrect, and you should never buy the fish for this purpose alone. When the Siamese Algae Eater does eat algae, there’s a limit to what it will take. So it will not solve any algae problems in your aquarium. You’ll have to find another means for that yourself. Feed you Siamese Algae eaters with a veggie pellet or wafer to ensure they get all the nutrients they need. We feed all our catfish and algae eaters Hikari Algae Wafers from Chewy.com. If you do offer commercial fish food, your fish may also prefer this and leave any algae alone. This can cause problems with tank mates should you not be offering enough food to the community. Finally, it should be noted that as your fish gets older, it will consume less algae. 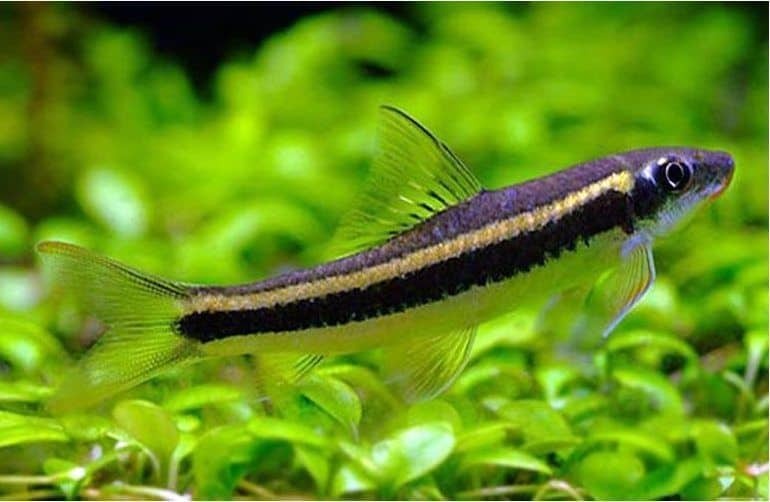 The Siamese Algae Eater is a lovely little fish that can become an active and delightful member of your aquarium’s community. However, it is not the solution to any algae problem, and it requires a well-maintained aquarium to properly thrive. They are perfect for a heavily planted aquarium like the one above and will thrive with some Malaysian driftwood and a fast flowing current through the tank. Also, remember to offer them a balanced diet and don’t rely on them eating the algae in your tank as this may not be the type of algae the thrive on. Supply them with extra food like Hikari Algae Wafers available from Amazon worldwide delivery. You should also be wary of mislabelled fish that look similar but require different care. For more great freshwater fish suitable for a mixed community aquarium, read our guid on the 15 Best Freshwater Fish for beginners.